Chocolate cake...who doesn't love them? From fudgey dense ones to light airy mousse creations. Everyone has their favourites and their favourite recipes. I've had my fair share of trials with different recipes. My colleague generously shared her recipe. 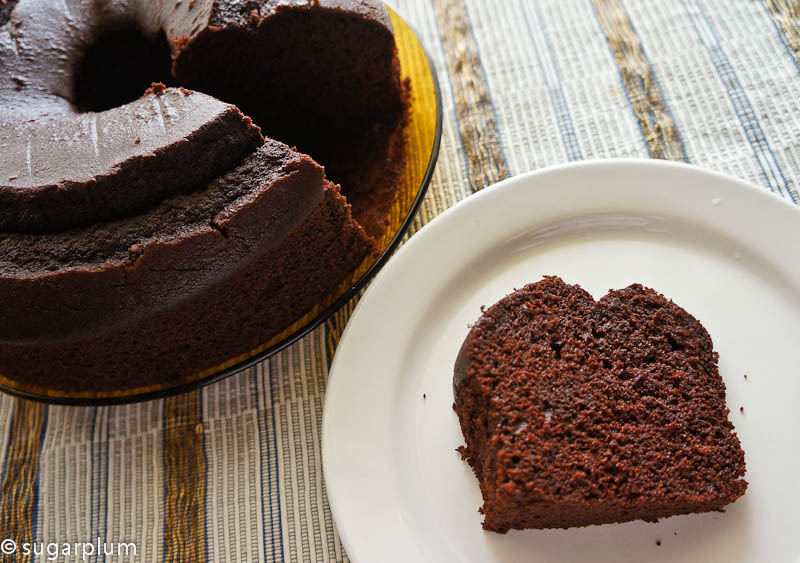 This version gives a moist dense-looking cake, yet is pretty light when you bite into it. 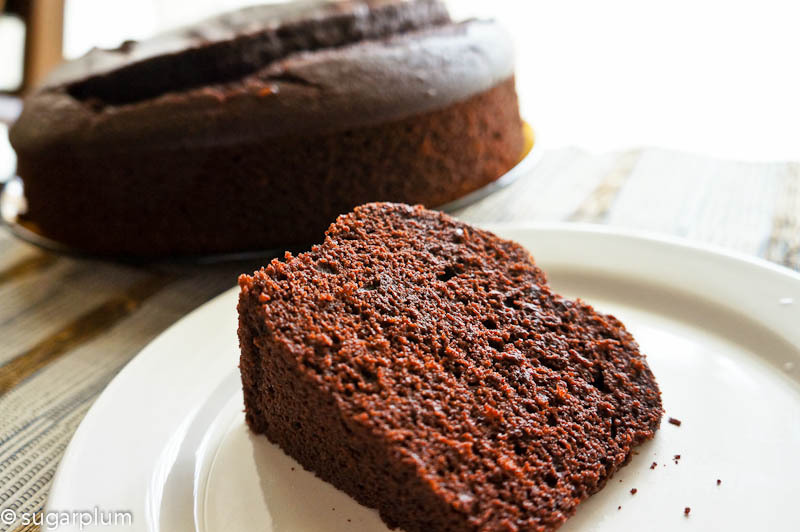 If you skip the frosting, it's less rich and just as yummy. As a plus point, making this couldn't be easier - no creaming, no folding. I'm not a good baker - sponges and chiffons defy me with all that airy lightness. After a good round of thumbs-up from the first one, I thought I'd bake one out for a Christmas party. And because it's for a party, it had better be all tarted up ie frosted. The photos show both versions - the stay-at-home cake vs the paint-the-town-red cake. This is my very first attempt at icing and decorating a cake. Until now, all my cakes have been naked cakes. After reading up on different creams and their performance in heat and humidity (KL weather), I decide to chicken out and do a simpler ganache. No need to OTT on the 'make-up'. 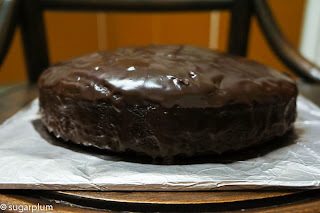 Lacking the confidence to pour the ganache on, I decided to spread it instead - more control, less dripping and less mess to clean up. 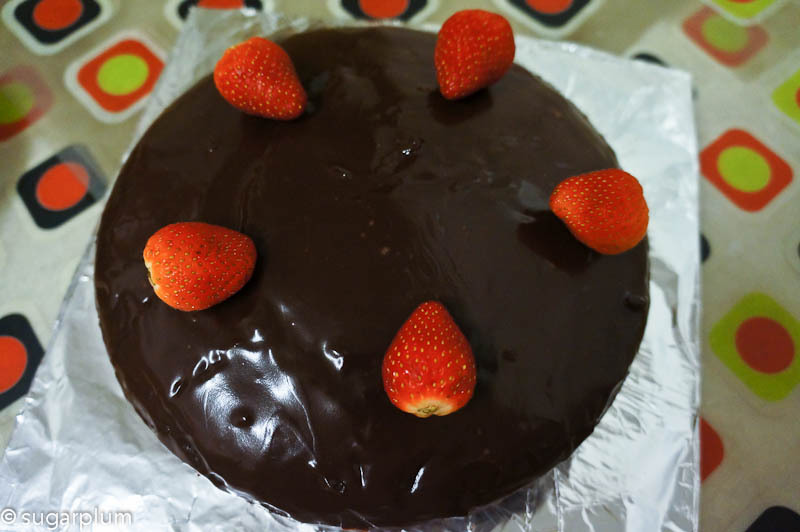 You can see that I need to work on the cake decorating skill :) Should have halved the strawberries instead of plopping them on whole. Have a merry Christmas and happy holidays. 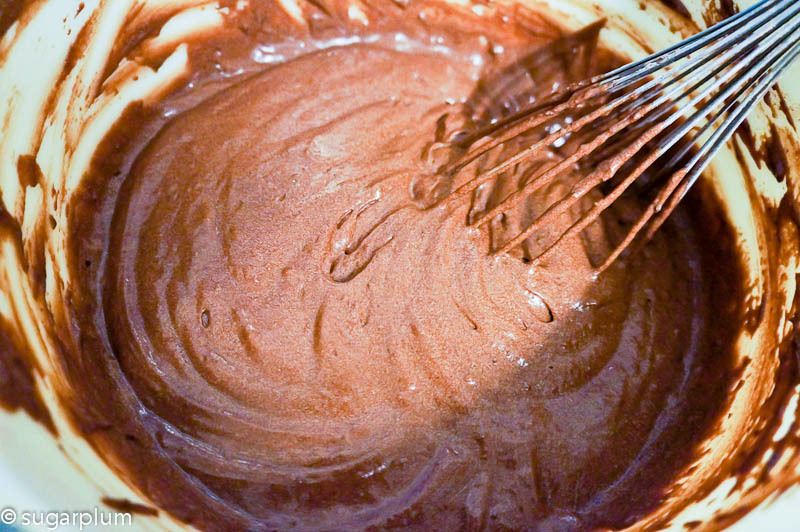 There should be extra ganache left over. Apparently you can freeze this for later use and heat it up using a water bath or double boil. Or make truffles. I'll have a go at this later. 1. 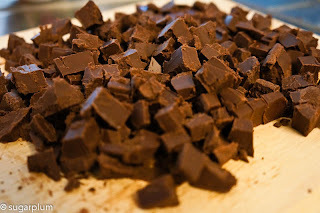 Mix the dry ingredients - flour, cocoa, leavening agents - and sift it to remove any lumps. Set aside. 2. Mix the eggs and sugar together. Give it a light beating. 3. Pour melted butter into the egg-sugar mixture. Beat slowly for about 3 minutes just to incorporate the fat with the eggs. 4. Stir in the evaporated milk, then the water. Mixture is quite runny at this stage. Don't worry. 5. Stir in the sifted dry ingredients, and your mix should come together and thicken. 6. Pour into pan and bake at 160C oven for 45 - 50 minutes, depending on your oven. It's safe to check at 40 minutes. Mine took 55 minutes. 7. Remove from oven, leave in pan for 15 minutes, then turn out onto wire rack to cool. 8. If intending to frost the cake, make sure cake is completely cool otherwise icing will just run off. 1. Chop the chocolate into smaller pieces to melt easier. 2. Heat up the cream until just before boil. 3. 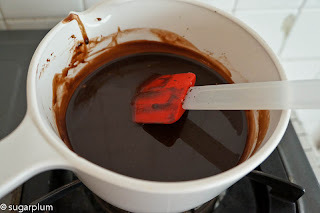 Pour the hot cream into the chocolate, wait about 3 minutes, then use a spatula to stir the melting chocolate. 4. Keep stirring until you get a smooth glossy mixture. 5. Cool to room temperature before using - about 20 minutes. it should thicken slightly. If you want to pour it on the cake, you can do it now. 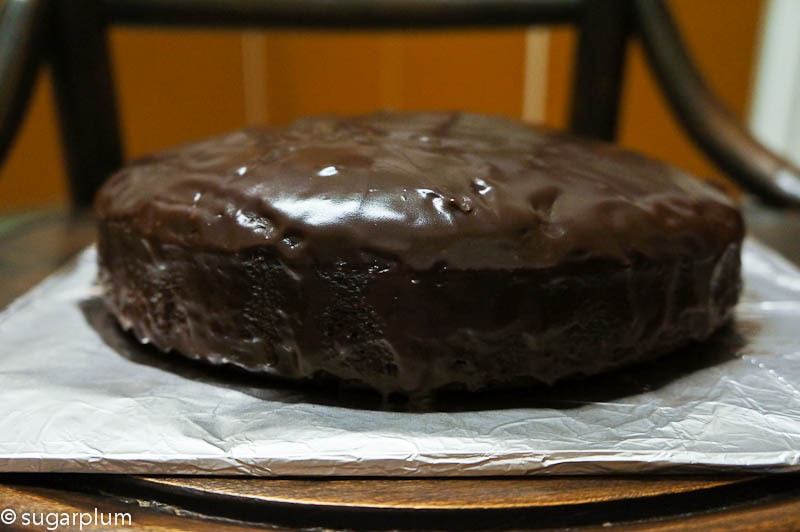 If you prefer to spread it, then cool the ganache in the fridge, until you get a spreadable consistency. I left mine for about 1 hour in the fridge. 1. You'll notice that the both cakes cracked at the top. I think it's because the oven thermostat is acting up and it was hotter than 160C. i vote for cocoa coated truffles! Hi Sylvia, I'll be sure to try making truffles with the extra ganache. Dusted with cocoa, or rolled in nuts?